Confirmed in main proceedings re Pemetrexed: The counterion matters! Please note that Hepp Wenger Ryffel is involved in this matter on behalf of the plaintiff. The patent in suit is Lilly‘s EP 1 313 508 B1 which is litigated in various countries; see the EPO Register and Swissreg for further details. It’s all about a generic version of Lilly’s Alimta®, ie Actavis’ Amtiris®. While the claims of Lilly’s EP’508 specifically require pemetrexed disodium, Amtiris® comprises pemetrexed diacid. 12. A product containing pemetrexed disodium, vitamin B 12 or a pharmaceutical derivative thereof, said pharmaceutical derivative of vitamin B12 being hydroxocobalamin, cyano-10-chlorocobalamin, aquocobalamin perchlorate, aquo-10-chlorocobalamin perchlorate, azidocobalamin, chlorocobalamin or cobalamin, and, optionally, a folic binding protein binding agent selected from the group consisting of folic acid, (6R)-5-methyl-5,6,7,8-tetrahydrofolic acid and (6R)-5-formyl-5,6,7,8-tetrahydrofolic acid, or a physiologically available salt or ester thereof, as a combined preparation for the simultaneous, separate or sequential use in inhibiting tumor growth. Protection of pemetrexed diacid and the pharmaceutically acceptable salts thereof by the basic patent EP 432 677 B1 and a subsequent SPC has lapsed in December 2015. The FPC had already dismissed Lilly’s request for interim injunctive relief in corresponding summary proceedings S2016_004; see this Blog here. In a nutshell, it had been held that limitation from antifolate to pemetrexed disodium during prosecution constitutes an abandonment of subject-matter. But even if it would not be considered an abandonment, the FPC denied an infringement under the Doctrine of Equivalents (DoE) since the skilled person would have understood the wording pemetrexed disodium as a strict limitation, in view of the claims and in further consideration of the specification. As a general rule, the FPC makes its decisions as a three-member panel. However, the FPC can make its decisions as a five-member panel on the order of the President where this is in the interest of the further development of the law; Art. 21(2) PatCA. The defendant requested that the panel of judges be extended to five members, in view of the critical legal questions at stake (equivalence; abandonment of subject-matter during prosecution and its interplay with claim construction in after-grant proceedings). First, the FPC held that this request is belated. It has only been filed when the parties had already been served with the expert opinion of the judge-rapporteur — which has been unfavorable for the defendant. In the FPC’s view, this might well be the actual motivation of the request, not the complexity of the legal questions at stake. Im Übrigen gibt die Tatsache, dass der Antrag der Beklagten erst auf den Erhalt des für sie negativ ausgefallenen Fachrichtervotums erfolgte, Anlass zur Frage, ob nicht eher dies — und nicht die Rechtsfragen — Anlass für den Antrag war. On the merits, the FPC further holds that this is no case of special interest for the further development of the law. Appearance of bias due to prior involvement of the same panel of judges in corresponding summary proceedings cannot be an issue, either; Art. 47(2) lit. d CPC. The defendants argued that it was only the combination with vitamin B12 that made pemetrexed reasonably usable in anti-cancer therapy, since pemetrexed alone had been too toxic. This purportedly is the ‘core of the invention’. Even though the Supreme has recently used the term ‘core of the invention’ — yet only with a reference to literature from 1985 — the FPC clearly holds that the concept of a ‘core of the invention’ (resembling the outdated concept of a ‘general gist of the invention’ / ‘allgemeiner Erfindungsgedanke’) is neither necessary nor useful at all in the assessment of infringement. There is either literal infringement or infringement under the DoE, the latter being assessed with the three-step questionnaire. Für Überlegungen zum Kern der Erfindung bleibt da weder Raum noch Bedarf. 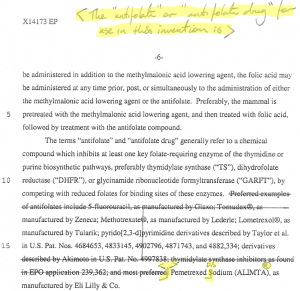 The wording of the claims had been narrowed down during prosecution in order to overcome the examiner’s objections re novelty, and to proceed to grant: The broad term antifolate had been amended in the claims to pemetrexed in first place, and finally to pemetrexed disodium. The FPC thus assessed whether the DoE is applicable at all to the feature pemetrexed disodium. The FPC notes that the patentee is bound by the limitation that he had accepted during prosecution in order to obtain the patent, and that he is therefore prevented under principles of good faith (Art. 2 CC) to circumvent this limitation by asserting equivalence. 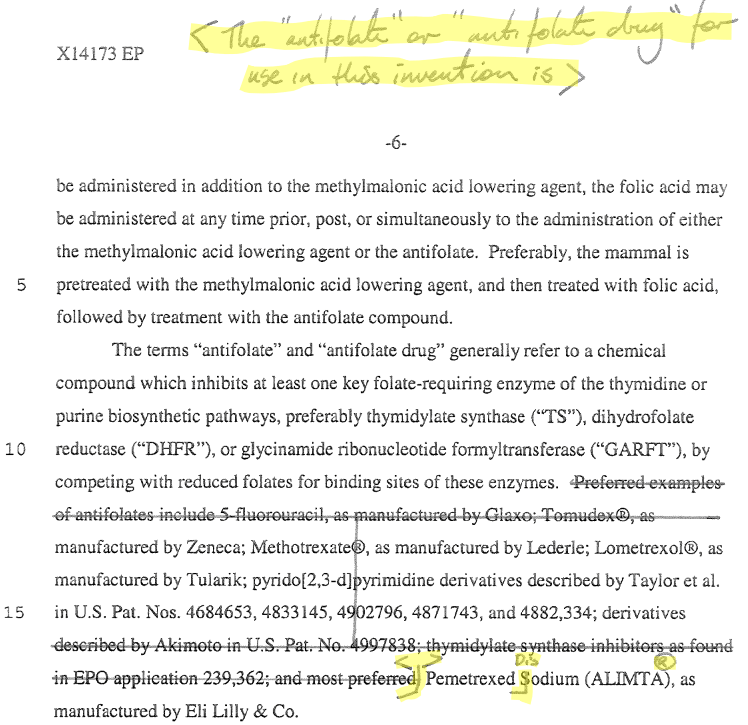 The FPC notes that an admissible intermediate generalisation of the term antifolate is missing in the application as filed (the FPC refers to this as the onion-shell principle); the patentee has to face the consequences thereof, not the public. The FPC refers to a decision HG060066 of the Commercial Court Zurich in this respect. This is not to be confused with the Prosecution History Estoppel known in the U.S. — it rather highlights that the prosecution history is not just irrelevant. Finally, the third question asks whether it is evident for the skilled person that the replaced feature has the same effect, starting from the teaching of the patent in suit. Would the skilled person have understood the wording pemetrexed disodium as a strict limitation? The FPC notes that other components are defined more broadly in the claims, ie vitamin B12 or a pharmaceutical derivative thereof. Not so for pemetrexed disodium. The skilled person would thus have understood this as an intentional limitation, in further view of the specification. It is highly likely that this decision will be appealed to the Supreme Court. A comprehensive summary on the current status of proceedings relating to Lilly’s Alimta® can be derived from Lilly’s Form 10-K (Annual Report); see p 93-94. Expectedly, the defendant lodged an appeal to the Supreme Court. The judgment summary given by Lord Neuberger is available as a 7:11 min footage here. The full text is available as a PDF and html version. Fresenius Kabi ./. Lilly at the Court of Milan in a related matter: Declaration of non-infringement granted for pemetrexed diacid in combination with tromethamine. My Italian is not too good, but the reasons apparently resemble the gist of the FPC’s decision. See the decision here and brief comments on EPLAW Blog and IP Kat here and here.